At the rosybee site we have been planting borage is different areas for the last four years and, because it self seeds readily, this year there was at least one area in flower right from March onwards. Each borage plant will flower for about 2 months and then die off (and in a garden you would pull it out as it looks terrible at that stage) but even in a small area I find that a hot spell of weather will encourage more seed to germinate so new plants arrive in unexpected places - but no in an invasive way - just pull out the ones you dont want. The biggest area of borage is in our 'ploughed' section were we have allocated an acre of ground to growing borage and phacelia as a nectar crop. We last ploughed it in mid-August but I asked my husband to leave a section where I could see a lot of seedlings coming through. The result is that we have a final borage area just beginning to flower right at the end of September. The honeybees are very happy to have this as the only other abundant source flowers around in the hedgerows is the wild ivy. 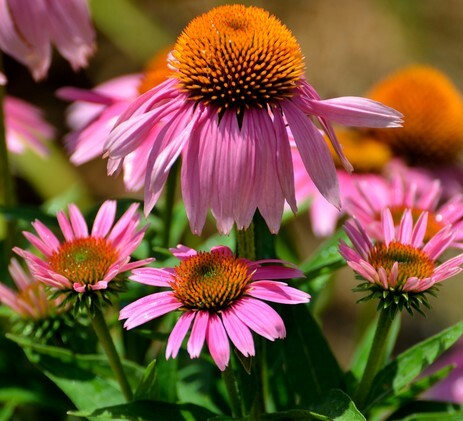 We have now added echinacea and veronicastrum to our range of stock to add even more choice for the bees as well as colour to your gardens. We also sell many other plants that are ideal for sustaining flowering through the late summer, which in many areas is have less natural nectar resources than the traditional 'june gap'.